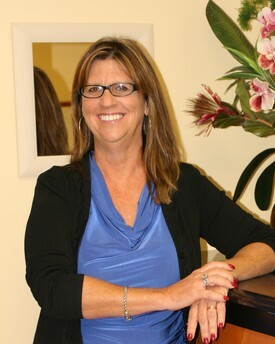 Eileen is our office manager and has been with Collegeville Dental Center since 1998. Eileen is proficient with all aspects of dental insurance and will gladly guide you through maximizing your benefits to achieve optimum dental health. Her many years of experience in dentistry has also provided her with an abundant knowledge of dental treatment, from cosmetic procedures to basic restorations. She guides our patients through their insurance questions in regard to dental procedures while providing a comfortable atmosphere for them. When Eileen is not in the office, she keeps her social and civic calendar full with her active family. She also tries to sneak in some quiet time to relax poolside whenever possible. 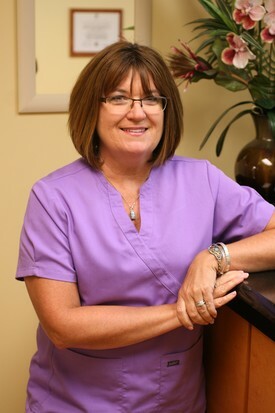 Clorinda is our patient coordinator and has been with Collegeville Dental Center since 1999. She works closely with the office manager to assist patients with insurance questions and dental treatment. Clorinda has many years of dental experience and knowledge which she will gladly share with patients to help them feel at ease in our office. Clorinda's cheery smile and calm demeanor is welcoming to everyone who comes into our office. Her grandchildren joyfully occupy most of her spare time. She also enjoys reading and taking walks with friends. A graduate of Dental Hygiene at Northampton County Community College, Abby has been with Collegeville Dental Center since its inception. Abby started working as an assistant and gained much of her clinical knowledge prior to attending college for dental hygiene. Over the past 20 years she has continued to learn through continuing education courses and hands on experience. 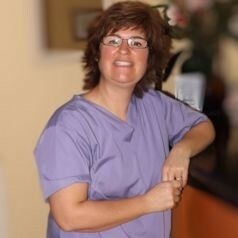 Abby has a great love of guiding her patients to improved dental health. 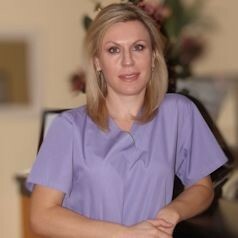 She has brought a great knowledge of dentistry and friendliness to our practice. In her free time, she enjoys cooking, DIY projects and her family. Abby has continued her education and obtained a license which allows her to deliver dental anesthesia to make our patients more comfortable with treatment. Jane graduated from Gwynedd Mercy University with a degree in Nursing in 1996. She then attended Montgomery County Community College and graduated with a degree in Dental Hygiene in 2001. While attending Montgomery Community College, she was honored to be accepted into Sigma Phi Alpha which is the National Honor Society for Dental Hygiene. She was also accepted into Phi Theta Kappa,which is the International Honor Society for 2 year colleges. Upon graduation, Jane was elected as a board member of Sigma Phi Alpha and served as President in 2008. Jane has continued her education and obtained her anesthesia license,which allows her to deliver dental anesthesia to our patients. She has been with our practice since 2005, and is happy to educate her patients in ways that can improve their oral health. In her spare time, she is an avid runner and enjoys spending time with her husband and daughter. Jane is also an active member of the church choir and plays the flute. A native of Ukraine, Marina attended Kiev State University prior to moving to the United States. 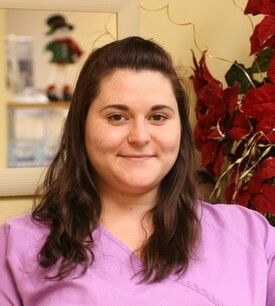 Marina graduated from Harcum College in 2010 with a degree in Expanded Functions Dental Assisting. She then joined our office in 2012. Marina also continues to attend lectures to expand her dental knowledge. She enjoys Collegeville Dental Center because she feels our office provides a casual atmosphere while still providing a serious and dedicated dental service to our patients. 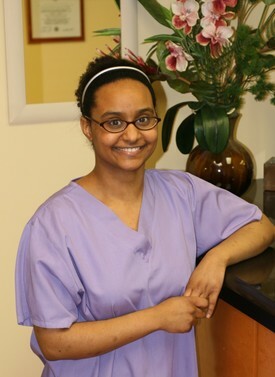 Her concern for her patients comfort and needs is evident while assisting in all aspects of dental treatment. Marina is also fluent in Russian and Ukrainian. While away from the office, Marina loves to meet new people, try new things, and travelling. She has a passion for the beach, swimming, and reading but truly enjoys sharing all these experiences with her daughter and family. walks, and learning new things. 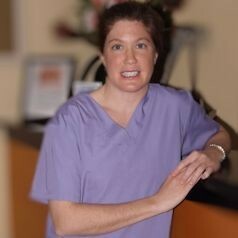 Jackie brings to our office over 9 years of dental experience at the front desk and assisting. She has many years of orthodontic experience with a welcoming and friendly smile to greet our patients as they arrive in our office. Jackie is also certified to expose radiographs. On her days off Jackie assists her husband with their home based business. She can be found poolside, spending weekends with her friends and time with her family when she isn’t busy at our front desk.